Erhes lives with his parents, grandparents and uncle in Ger district far from the kindergarten. His family moved to Ulaanbaatar city from Erdenet city to let his son have necessary treatment and care. So his parents bring him to the kindergarten every day, because they believe that this is the only place in Mongolia that provides necessary care, therapy to their kid. Otherwise his parents cannot provide this care and therapy themselves. Erhes has cerebral palsy, spastic tetraparetis, quadriplegia. He was born at 37 weeks, 2600 gr, had birth asphyxia, did not cry after birth, 2-8 minutes later cried. Had jaundice when he was still in hospital. His hydrocephalus was diagnosed during 7 mont??? 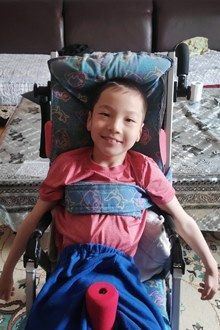 Erhes has cerebral palsy, he goes to specialized kindergarten for disabled children. This kindergarten is a state run facility and the only one in Mongolia that provide needed care for disabled children. The kindergarten offers care to children aged 2-6 years old and it also provides care to children of poor families. On regular basis they take medical analysis, have specialized doctor's visits. Tell your friends Erhes needs a sponsor!